It was July, 1952. The Czech national team had already departed for Helsinki, Finland to take part in the Olympic Games. But their most famous team member, Emil Zátopek , was not on the plane. His wife, Dana, was an emotional wreck, wondering what was happening with her husband? Was he in trouble? Was he in prison? Zátopek was actually at the airport and ready to head for the Games when he learned that a teammate, Stanislav Jungwirth, was denied the credentials to leave Czechoslovakia. According to the book, Today We Die a Little! : The Inimitable Emil Zátopek, the Greatest Olympic Runner of All Time, Jungwirth’s father was in prison for political offenses, and so the Czech powers that be thought the father’s son would a flight risk. According to the books’ author, Richard Askwith, In the post-war period, with the growing tensions of the Cold War, the socialist Czech government was highly sensitive to criticism and fearful of defections; in fact, they had arrested the entire ice hockey team – the reigning world champions – before they departed for a tournament in London as players were said to be singing disrespectful songs, and worse, contemplating defection. But Zátopek was outraged, and would not stand for this level of authoritarian heavy handedness, particularly in regards to a teammate. Zátopek was actually a member of the government, an officer in the Czech Army. But he also had an independent streak, one that grew wider and brighter as his global fame as a track phenomenon grew. He gambled that his name and reputation were bigger than the collective pride of the Czech government by informing the authorities that he too would not fly to Helsinki and participate in the Olympics if Jungwirth was forced to remain in Czechoslovakia. Askwith stated that Jungwirth pleaded with Zátopek to go to Helsinki, not wanting to be the reason that Czechoslovakia’s greatest athlete did not go to the Olympics. And yet, Zátopek insisted. News of Jungwirth’s exclusion emerged the evening before the athletes were due to fly, when they turned up at the Ministry of Sport to collect their travel documents. Jungwirth was devastated to find that there were none for him, but quickly accepted that making a scene would only make matters worse. But Emil was incandescent. ‘No way,’ he told the officials. “If Standa does not go, nor will I.” Then he stormed out, leaving his paperwork behind him. The next day, on the morning of the flight, Jungwirth implores Zátopek to calm down. Emil insists on standing his ground. He gives Jungwirth his team outfit and tells him to return it to the Ministry when he returns his own. Then he goes off to train alone at Prague’s Strahov stadium. Somehow, Zátopek’s gamble pays off. Jungwirth is given his papers so he and Zátopek can take off for Helsinki. But the risk was significant. Zátopek could have lost his job in the military or even worse, his freedom. Perhaps less personally impactful, but more relevant to the world of sports, Zátopek would have lost a chance at glory – which as it turns out was the singular greatest Olympics for a single track and field athlete. Zatopek won the 10,000 meter and 5,000 meter competitions, as well as the marathon within an 8-day period. No one had ever done that before. No one since. In fact after Helsinki, he would continue to toe the Party Line. But there were limits. Many years after the Zátopek’s Olympic swan song at the 1956 Melbourne Games and his retirement from international competition, Zatopek was still a very popular personality both at home and abroad. 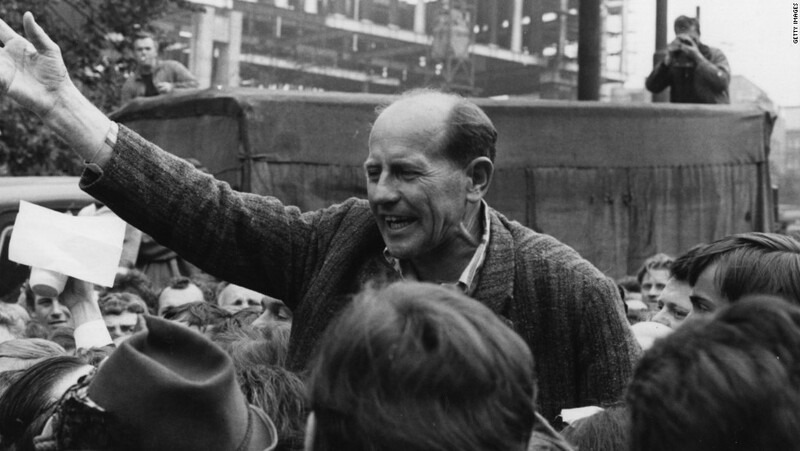 Someone who knew what life was like outside of socialist Czechoslovakia, Zatopek was happy with the growth of democratic fervor, the rise of reformer Alexander Dubcek and the Prague Spring of 1968. Many gathered outside the national public radio headquarters fin Vinohradska Street, trying to defend their precious uncensored radio. When the battle was lost, they massed around the corner in Wenceslas Square. It was a remarkable display of popular unity and defiance. And the most visible symbol of that defiance was a balding man in a rumpled jacket, standing on a pedestal by the statue of St Wenceslas, furiously denouncing the invasion. It was Emil. Given the chaos, anger and fear, it is hard to set down with absolute confidence what was said when and to whom. According to (Ludek) Pachman, however, at one point Emil “quite literally rushed toward a group of Soviet soldiers, he announced his name and sporting titles, and then straight away said (in Russian), ‘come let’s talk. '” Other accounts spoke of Emil moving from tank to tank, talking to individual solders in turn. According to Askwith, Zátopek’s very visible resistance would be akin to British football star, David Beckham, manning the barricades. Posted in Geo-politics, Other Olympics, Track and FIeld and tagged 000 meter and 5, 1952 Helsinki Olympics, Emil Zatopek, Prague Spring, Rishard Askwith, Stanislav Jungwirth, Today We Die a Little. Bookmark the permalink.